With this post, I want to try to clarify the Greek fiscal crisis. The problem is that it’s not clear exactly how serious the problem is, because most of the media coverage of the crisis has been directed towards the financial markets’ perception of it, rather than its underlying fundamentals. In the end, I think it’s important to understand both. 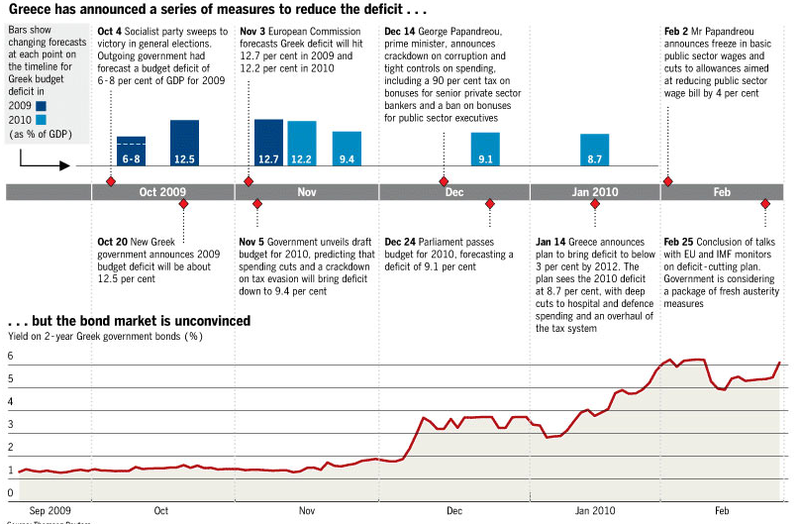 The Financial Times published a great timeline that shows perception and reality side-by-side. While there were certainly other important developments that bear in Greece’s fiscal position (in addition to those listed below), you can see that financial markets are basically making their own reality. For example, there was hardly a response to the October announcement that Greece’s budget deficit would be 12.7%, which was 5% higher than earlier estimates. In fact, the markets only became bearish on Greek debt after it the government announced that it would try to bring the debt down to 9.4% through various measures. Apologists for the markets would be right to wonder why investors should be inclined to believe the government of Greece when it said it could control the budget deficit. Fair enough. Still, one has to wonder why the markets suddenly started worrying about Greece’s fiscal problems, when only a couple months ago, the possibility of a whopping 12.7% budget deficit barely caused investors to blink. Besides, the credit crisis has been raging since 2008, which means the markets have had plenty of time to digest the implications of recession for Greece’s fiscal position. To be fair, Greece also played a role in derivatives speculation, and on some level, it was even more nefarious than the speculators. Assisted by Goldman Sachs (who is now betting on Greek default [how un-ironic that is! ]), Greece entered into a series of swap agreements last decade, which it used to conceal its true debt burden. “By using an historical exchange rate that didn’t accurately denote the market value of the euro, Goldman effectively advanced Greece a €2.8 billion loan. Under EU accounting rules—which were tightened in 2008—Greece wasn’t obliged to include the loan in overall public debt on its books.” Now that those transactions have been uncovered and the truth is coming to light, financial markets are rightly re-evaluating the risk of further lending to Greece. There is no question that Greece’s debt problems are serious. As to whether labeling it a crisis is necessary, that depends on your standards. Greece ranks near the top of the list on a variety of individual “debt sustainability” criteria. At 94.6% of GDP, it’s net debt is among the highest in the world. Its projected 2010 budget deficit is also high, though not the highest. Its cost of borrowing is also significantly higher than projected GDP growth, which means that net debt will continue to grow until a budget surplus can be produced. When you average these measures together, it appears that Greece’s debt problems are the most unsustainable of any country in the world. But this is hardly news. On the other hand, the weighted average of the maturity of Greek debt is 7.7 years, well above average, and plenty of time (relatively) for Greek to sort through this mess and secure new lenders. Towards the latter end, it has hired a former bond trader to head its debt management agency. In order to improve its fiscal position, it has announced a series of austerity measures, including budget cuts, tax increases, wage cuts for public-sector employees, and stricter laws against tax evasion. At this point, a ratings downgrade looks inevitable, and some analysts think the crisis has already become self-fulfilling. As borrowing costs rise, it only makes it more likely that Greek will default, which causes rates to rise further, and so on. On the other hand, Greek politicians are being forthright about their position (“Greece’s finance minister, George Papaconstantinou, remarked this week: ‘People think we are in a terrible mess. And we are.’ “) and have a plan for rectifying the situation. There is cause for skepticism here, but also for hope. And that goes not just for Greece, but also for the Euro. The direct implications for the discount rate (the rate at which depository institutions borrow short-term funds from regional federal reserve banks) hikes are admittedly hazy. Some economists analyzed the move in and of itself as a signal that the Fed wants banks to borrow more from each other, and less from the Fed. Others saw it as a political move, designed to appease both inflation hawks and an angry public that is dismayed over the massive profits that banks have earned from this prolonged period of easy money. If the former are right and the move has an economic basis, then the discount rate will probably have to be hiked at least once or twice more in order to have any kind of measurable impact. If it was indeed political, then another rate hike in the near-term is unlikely. As I said, investors remain focused on the Federal Funds Rate (the rate at which banks borrow directly from each other) as the crux of the Fed’s monetary power. In this context, the discount rate hike didn’t move the markets because the Fed, itself, cautioned investors from inferring a connection between the discount rate and the federal funds rate. Nonetheless, some analysts posited a connection anyway: “The Fed can talk all day about how the discount rate hike is technical and not a policy move, but the market sees it as a shot across the bow. Not tomorrow, or the next day, but soon, they will be lifting the Fed funds rate target as well as the economy is starting to regain momentum…” Whether this represents the mainstream perception, however, is debatable. On the one hand, investors have been talking about a (ffr) rate hike for more than six months now. As the above analyst pointed out, the economy is growing (5.7% in the fourth quarter of 2009…not too shabby! ), and most other indicators (with the notable exception of housing) are trending upwards. On the other hand, expectations for timing continue to be pushed back (the current consensus – via interest rate futures – is that there is a 70% chance of a 25 bps hike in September). This is due in no small part to the Fed itself, whose “emissaries” are doing their best to dispel the possibility of a near-term hike. Some samples: San Francisco Federal Reserve Bank President Janet Yellen said the economy “will continue to need ‘extraordinarily low interest rates.’ ” Dennis Lockhart, the president of the Atlanta Federal Reserve Bank, conveyed that, “If his forecast of slow growth proves accurate, Fed monetary policy will have to hold rates low for longer.” Federal Reserve Bank of St. Louis President James Bullard Thursday said “speculation of an imminent hike in the Fed’s target interest rate was ‘overblown,’ calling an increase in the short-term federal funds rate ‘just as far away as it ever was.’ ” There’s not much ambiguity there. Analysts also continue to look for clues as to when the Fed will begin to reverse its quantitative easing program. “Bernanke said such steps could be taken ‘when the time comes.’ Given the weakness of the economy, Bernanke signaled that that time was still a long way off.” This kind of procrastination is not being met well, and there is concern that “the Fed will misjudge the situation and wait too long to tighten monetary conditions.” In the end, this is perceived as more of an inflation issue, and it is of secondary importance to interest rate policy for the capital markets. Forex traders, however, would be wise to focus on both aspects; inflation erodes the Dollar over the long-term, while higher interest rates make it more attractive in the short-term. For the time being, both remain low. In the not-too-distant future, either inflation and/or interest rates must rise. If/when the markets get over their sudden fixation on the debt crisis (a long-term issue) in Europe, they will return their attention to the Fed, probably just in time for the start of some big changes. The R in BRIC Stands for….Romania? By now, most investors are well aware of the acronym BRIC, which stands for the emerging market powerhouses of Brazil / Russia / India / China. When the idea was conceived in 2003, it seemed to make a lot of sense, as these four economies were at the top of the GDP ‘league tables,’ year-after-year. While China, India, and to a lesser-extent, Brazil, all continue to outperform, Russia has begun to lag. Perhaps Russia needs to be replaced as a member of BRIC. If the acronym is to be preserved, the only choices are Romania or Rwanda. But seriously, last year Russia’s economy declined by 8%, compared to expansions of 6.5% and 8.3% in India and China, respectively. The Ruble fared equally poorly, relatively speaking. Compared to the Brazilian Real, which erased most of its 2008 decline, the Ruble’s rise offset less than half its previous losses. A similar picture can be painted with its. stock market. Not coincidentally, oil/gas prices have followed a similar pattern. That the fortunes of Russia’s economy are too closely tied to energy exports is only half of the problem. The other half is as much cultural as structural. Russia’s economy is still largely oligarchical, and competition is lacking. Corruption is rampant, and the bureaucracy is out of control. In short, there is “a combination of corruption, poor governance, government interference in the private sector, and insufficient investment in the oil and gas sector,” which makes it unlikely that the Russian economy will embark on a stable course of development anytime soon. “What’s more, the warning signs of more economic trouble ahead are growing — for example, the increasing rate of non-performing loans on Russian banks’ balance sheets.” To put it bluntly, Russia’s economic prospects are somewhere between bleak and pathetic. What about the Ruble, then? In the long-term, the Central Bank has pledged to shift its monetary policy away from micromanaging the Ruble. For the time being however, it remains focused on keeping the Ruble within a carefully prescribed range. Of course, it’s unclear whether the Central Bank sees its charge as defending the Ruble against a decline or against excessive depreciation, so currency traders shouldn’t read too much into it. 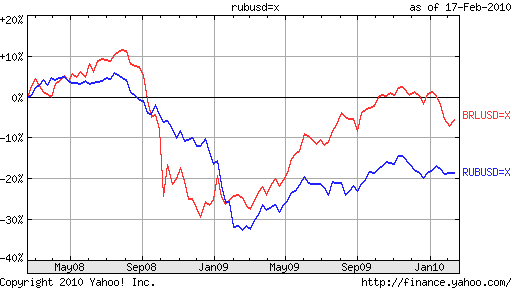 On the surface, the Ruble would seem to represent an excellent candidate for the carry trade. Despite being trimmed 10 times in 2009 alone, the Central Bank’s benchmark interest rate still stands at a healthy 8.75%. Moreover, the Central Bank has basically promised not to cut rates any further from the current record low. Remarkably, though, real interest rates are slightly negative, as Russia’s estimated inflation rate is 8.8%. Even more remarkably, this is the lowest level in decades! In other words, there is no interest too be earned from a Ruble carry trade, and the only upside is the appreciation in the Ruble. And that ignores the downside risks, which are significant. After Russia defaulted on its debt in 1998, the international financial community basically lost confidence in the Ruble. Now, all of Russia’s government debt is denominated in foreign currency, mainly Dollars and Euros. Russian investors seem to harbor the same suspicions about their currency, and in 2008, the Ruble’s fall became self-fulfilling as investors transferred more than $150 Billion out of Russia, in the fourth quarter alone. 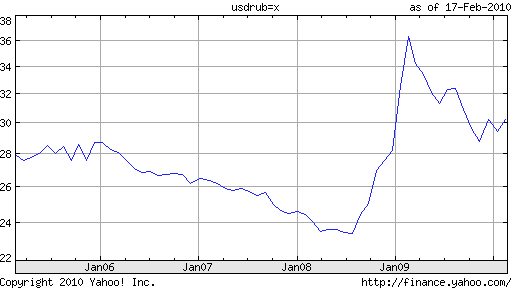 In short, I see very little upside from investing in the Ruble. There is no money to be earned from a Ruble carry trade. Betting on the Russian economy seems misguided. Betting on a continued rise in oil and gas prices would be better achieved by buying oil and gas futures directly. Meanwhile, any hiccup in the global economic recovery will certainly be met with an exodus of capital from Russia. Stick to the BIC countries instead. Since the emergence of the debt crisis in Greece, UK policymakers have been once again patting themselves on the back for not joining the Euro. Otherwise, they would currently be in the same awkward position as France and Germany, whose economic might underpins the entire Eurozone and are wondering about if and how they should lend their support to Greece. Given that the Pound has fallen at an even faster clip than the Euro in recent weeks, however, it seems investors don’t share their sense of complacency. What gives? One might be inclined to posit that the Pound is falling for reasons unrelated to Greece and the travails of the EU. After all, most of the economic data emanating from the UK these days isn’t exactly positive. GDP grew by an abysmal .4% in the fourth quarter of 2009, and the Bank of England, itself, has revised is 2010 projections down to 1.5%. In addition, inflation is creeping up and short-term rates remain low, such that real interest rates (and by extension, the carry associated with holding Pounds) in the UK are effectively negative. While this alone would be grounds for selling the Pound, a cursory glance at GBP/USD and EUR/USD cross rates reveals that the Pound and Euro are falling in tandem. In my eyes, this implies that investors have impugned a connection between the situation in the EU (i.e. Greece and the other “PIGS” economies) and in the UK. And no wonder, since UK debt levels are as worrisome as any other country, developing or industrialized. Its budget deficit is 13%, slightly higher than in Greece. Private debt is estimated at £1.5 Trillion, or £60,000 per household, which is the highest (in relative terms) in the world. “Then there’s the trillion-pound bank bail-out, the trillion-pound public-sector pension liability, the trillion-pound public debt and those off-balance-sheet private finance initiatives schemes. If you add up Britain’s real liabilities you find that the UK is heading for a total debt burden of several times its GDP,” summarized one analyst. Of course, this is nothing new. I, myself, have written about the looming UK debt crisis on previous occasions. While such a crisis is still years away, the turmoil in Greece is causing investors to cast fresh eyes on the similarities and differences with the UK, and they clearly don’t like what they see. On the one hand, Britain’s monetary independence means that it can deflate its debt (by simply printing more money), unlike Greece, whose membership in the European Monetary Union precludes such a possibility. While this means that Britain is ultimately less likely to default on its debt, it makes it more likely that it its currency will have to weaken at some point in the future, so that its liabilities remain manageable. Bond investors, then, are right to prefer UK Bonds, but currency investors are equally right to shun the Pound in favor of the Euro. It seems that Britain’s conception of itself is somewhat flawed. While it thinks of itself as akin to France or Germany (and hence, is quite happy not to be an EU member at the moment), the markets seem to think of it as a Spain or Portugal. The implication is that the markets currently believe that the UK would do better if it was a member of the EU than on its own. Of course, that proposition is debatable (and still unlikely), but it’s worth bearing in mind because it’s what investors apparently believe. As usual, the BOE remains (perhaps willfully) oblivious of all of this. It is mulling an extension of its quantitative easing program, which is supposed to end this month. This program is responsible for an expansion of the money supply equal to 14% of GDP in 2009 alone! Most economists consider it a dismal failure, and it seems to have succeeded only in catalyzing growth in prices (aka inflation) rather than output (aka GDP). “The suspicion is that the UK government and Bank of England is not worried that the pound remains weak in this repositioning of currencies. They may indeed welcome it. There is no immediate appetite for raising interest rates to strengthen sterling and no point making exports harder by strengthening the exchange rate.” They would be wise to bear in mind, though, that while currency depreciation is useful for devaluing existing debt, it can have the unintended consequence of scaring off investors, and make it difficult to fund future debt. Currency investors may be ahead of them on this one. CAD/USD Parity: Reality or Illusion? In January, the Canadian Dollar (aka Loonie) registered its worst monthly performance since June. Many analysts pointed to this as proof that its run was over, after coming tantalizingly close to parity. Others insisted that the decline was only a temporary correction, a mere squaring of positions before the Loonie’s next big run. Who’s right? Both! The second narrative explains why the Canadian Dollar continues to hold its own against most other currencies. 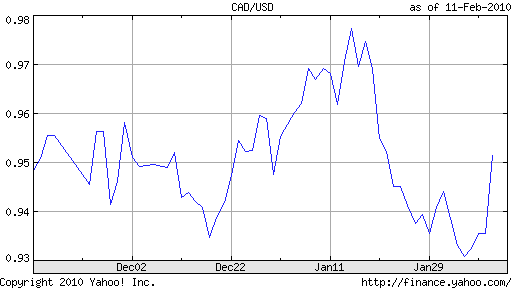 Specifically, Canada’s economic recovery continues to gain momentum as commodity prices continue their rally. In the latest month for which figures are available, the economy added about 80,000 jobs, more than five times what forecasters were expecting. This turn of events is helping to quash the “view that the Canadian trade sector is incapable of growth with a strong currency,” and making traders less nervous about sending the Loonie up even higher. Still, Canada’s capital markets are among the most liquid and stable in the industrialized world, and if risk-aversion really picks up, it won’t suffer as much as some other economies. “The Canadian economy is not as structurally impaired as the U.S. or the U.K. It creates a sense that Canada is less exposed to the fickleness of foreign investors that are causing uncertainty in other locations.” In fact, the Central Bank of Russia just announced that it will switch some of its foreign exchange reserves into Canadian Dollars, and other Central Banks could follow suit. While the Canadian Dollar should continue to hold its own against other currencies, the same cannot necessarily be said for its relationship to the US Dollar. 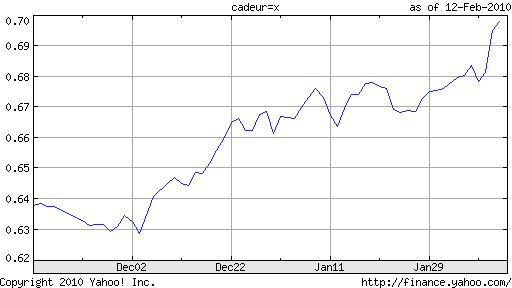 “Options traders are the most bearish on the Canadian dollar in 13 months…The three-month options showed a premium today of as much as 1.34 percentage points in favor of Canadian dollar puts.” In other words, the price of insurance against a sudden decline in the CAD/USD is rising as investors move to cushion their portfolios against such a possibility. While this trend could ease slightly in the coming weeks, I personally don’t expect it to disappear altogether. All else being equal, given a choice between owning Loonies or Greenbacks, I think most investors would choose Greenbacks. Could Greece’s Fiscal Problems Really Sink the Euro? Currency markets operate in funny ways. Greece’s fiscal problems are hardly a new development. During years of boom and bust alike, it ran unsustainable budget deficits. Why investors have decided to fret now – as opposed to last year or next year, for example – on the distant possibility of default, is somewhat mysterious. After all, the credit crisis exploded in 2008, and conditions now are inarguably more stable than they were at this time last year, when volatility and credit default spreads (insurance against bond default) – two of the best measures of investor risk sensitivity – were still hovering around record highs. On the other hand, the unveiling of Dubai’s hidden debt problems, has certainly provided impetus to investors to re-evaluate the fiscal situations in other highly leveraged economies. In addition, Greece just estimated that its budget deficit for 2010 at 12.7%, 4% higher than earlier estimates, which were also shockingly high. Regardless of 1, the markets are now focused firmly on Greece – and by extension, the Euro. How serious are Greece’s fiscal problems? Serious, but not insurmountable. Its sovereign debt recently surpassed 125% of GDP, higher than the US, but lower than Japan, for the sake of comparison. Of course, the Greek economy is hardly a picture of robustness. Neither is the US, these days, for that matter, but its size means that it is pretty much immune from speculative attacks on its credit and capital markets. Greece, on the other hand, remains extremely vulnerable to the whims of international investors. On the whole, these investors still remain willing to finance Greece’s budget deficits; the last bond issue was five times oversubscribed, which means that demand exceeded supply by a healthy margin. Still, interest rates are rising quickly, and spreads on credit default spreads have risen above 400 basis points, suggesting that nervousness is growing and Greece cannot take for granted that future bond issues will be met with such healthy demand. In this context, in stepped the European Union. In fact, it isn’t even clear if Greece asked for help. As I pointed out above, the Greek debt “crisis” is largely playing out in capital markets, and doesn’t necessarily reflect a change in the fiscal reality of Greece. Still, leaders of the EU were alarmed enough to convene a meeting between the finance ministers of member states, to discuss their options. After weeks of denial that any kind of aid to Greece was being considered, EU political leaders announced that they were prepared to step in to help after all, but they were vague on the details. There were no ledges of specifc dollar amounts, only hazy promises of support should conditions warrant it. In the end, what was clearly intended to comfort the markets achieved the opposite effect, as investors took no comfort in the “moral support” and worried about the new uncertainty. It’s premature to say whether this whole episode will threaten the viability of the Euro. Much depends on whether Greece (Portugal and Spain, too, for that matter) can get its fiscal house in order (Among other things, it has promised to reduce its 2010 budget deficit by 4%). More importantly, it depends how, and to what extent, the EU responds to this crisis as a community. 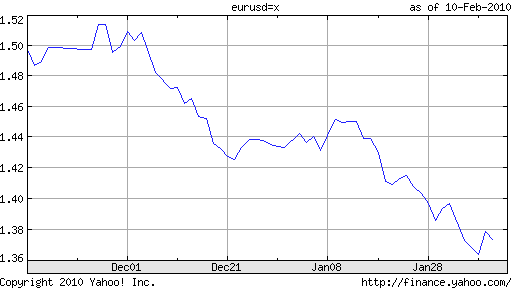 The Euro is already 10 years old, and you would think that it would have been accepted already within the EU, as it has by the rest of the world. On the contrary, it remains deeply divisive and fraught with politics. Many of its critics have seized on this opportunity to challenge to raise fresh calls for its abolishment. If the problems of Greece deteriorate to the point that other EU members are actually required to intervene, you can expect these calls to crescendo. Last month, I reported on how anticipation is (was) building towards a revaluation of the Chinese Yuan (RMB), confidently stating that “The only questions are when, how and to what extent.” While I’m not ready to recant that prediction just yet, I may have to temper it somewhat. On the one hand, the case for RMB revaluation is stronger than ever. Among large economies, China’s economy is by far the strongest in the world, clocking in GDP of close to 2009% while most other economies were lucky to “break even.” Meanwhile, its export sector – supporting which is the primary purpose of the RMB peg – is once again robust, having recovered almost completely from a drop-off in demand in 2008 and the first half of 2009. 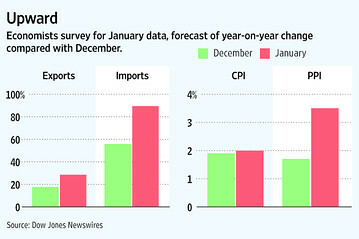 In fact, exports grew by 30% in January, on a year-over-year basis. China’s share of global exports is now an impressive 9%, up from only 7% in 2006. From an economic standpoint, then, the case for an artificially cheap currency is no longer easy to make. At the same time, the RMB peg is contributing to bubbles in property and other asset markets. That’s because the Central Bank of China has been forced to mirror the monetary policy of the Fed, as a significant interest rate differential would stimulate uncontrollable capital inflows from yield-hungry investors. While the US can still handle interest rates of close to 0%, China’s economy clearly can not. Thus, consumer prices are slowly creeping up, and property prices are soaring. The most effective (and perhaps the only) way for China to contain both consumer price and asset price inflation is to hike interest rates, which which in turn, would necessitate a rise in the RMB. There is also the notion that the peg is becoming increasingly costly to maintain. China’s forex reserves already total $2.4 Trillion, and each Dollar that it adds will be worth less if/when it ultimately allows the RMB to appreciate further. In addition, China’s economic policymakers continue to fret about its exposure to the fiscal problems of the US, with one pointing out that, “China has effectively been kidnapped by U.S. debt.” Of course, they no doubt realize that there isn’t a better option at this point; its attempt to diversify its reserves into other assets proved disastrous. The solution to both of these problems, of course, would simply be to allow the Yuan to fluctuate based on market forces, or at least for it to resume its upward path of appreciation. Political pressure on China to revalue, meanwhile, is even stronger than it was last month. While not invoking China by name, President Obama has been increasingly blunt about the need to pressure it on the RMB: “One of the challenges that we’ve got to address internationally is currency rates and how they match up to make sure that our goods are not artificially inflated in price and their goods are artificially deflated in price.” In addition, rumor has it that the Treasury Department could finally label China as a “currency manipulator” in its next report, which would allow Congress to impose punitive trade sanctions. On the other hand, however, is China’s massive reluctance to allow the Yuan to appreciate. Part of this is related to face; with the US and other countries stepping up pressure on a number of fronts, China’s leaders don’t want to be seen as weak, and could act contrary to their own interests if it thinks it can earn political points in the process. “China is unlikely to make significant concessions to U.S. pressure on the yuan, particularly now when the two countries are involved in a range of disputes, including U.S. arms sales to Taiwan,” explained one analyst. More importantly, the leadership is nervous that the nascent economic recovery is not sufficiently grounded for the peg to be loosened. While 9% growth in most other economies would be cause for celebration, in China, it is being interpreted as evidence of fragility. There you have it. Reason on one side, and politics on the other. Unfortunately, it seems that politics always triumphs in the end. Despite Treasury Secretary Geithner’s recent assertions that the RMB will rise soon, investors know that China ultimately calls the shots: “When it comes to the exchange rate, China’s main consideration is China’s own stable economic growth and the structural adjustment of its economy. Foreign pressure is only a secondary consideration.” In short, the RMB is now projected to appreciate only 2% in 2010, according to currency futures, compared to 3.5% last month. In December, I posted about Ben Bernanke (Bernanke’s Background and Near-Term US Monetary Policy), specifically about how a basic understanding of Bernanke’s academic background and philosophical approach to monetary policy could be useful for predicting the general direction of interest rates, irrespective of prevailing economic conditions. This post, is somewhere between a follow-up and a step back. By this, I mean that when I last wrote about Bernanke, it was already a foregone conclusion that Bernanke would be approved for a second term as Chairman of the Fed. While his confirmation is still pretty much a given (despite the requisite speechifying by a small but vocal opposition), the fact that it has been so bumpy has caused all of us talking heads to seek higher ground and look afresh at the situation. My intention here, however, is not to look at other potential candidates for Bernanke’s position, as such would be a complete waste of time at this point. Nor do I want to discuss the implications of Bernanke’s eventual confirmation, as I have already done that. Rather, I want to discuss the implications of the delay/complications in his being approved. You would think that there wouldn’t be enough meat here for a substantive analysis, but you would be wrong. That the confirmation process has been anything but smooth tells us much about both public attitudes towards Bernanke and about the attitudes towards the Fed. With regard to Bernanke, there is now a strong amount of criticism being leveled against him – for fomenting the housing bubble via low rates, lowering rates too quickly, not injecting enough new money into the financial markets. That such criticism is often contradictory is not important. What is important, is that such criticism is increasingly being taken seriously by Bernanke et al, such that the Fed is gradually losing its position as an independent stabilizing force and is instead becoming a highly politicized organization, that may soon be subject to the same checks and balances as other branches of government. Of course, many commentators (and not a small number of politicians, as evidenced by the progress of Ron Paul’s ‘Audit the Fed’ bill), couldn’t be happier with this turn of events. They argue that the Fed has too much power, and for too long has been able to successfully operate in a public gray area with the power of a government institution but the freedom of a private one. Bernanke – and supporters of the status quo – argue that the Fed needs to be independent so that it can continue to shape monetary policy in line with certain economic objectives, rather than the whims of political parties and competing ideologies. Many of you are probably indifferent to this issue. But consider that the outcome of this battle (whether the Fed remains independent, or its decisions will become subject to Congressional scrutiny) – of which Bernanke’s confirmation is part of – carries potentially serious implications for currency markets. It is arguable that the Dollar’s safe haven perception at the onset of the credit crisis stemmed in part from actions that the Fed took to stabilize currency markets, in the form of swap lines and liquidity injections. If such decisions could be vetoed by the government, suffice it to say that investors would begin to question whether the Dollar was really the king of currencies that it purports to see. Kudos to anyone who correctly identifies that reference. But seriously, in light of the proposed changes in forex regulation that have generated a heated response on this blog and elsewhere, I want to offer some insight into a tangential issue: jurisdiction. Part of the problem with existing forex regulation is not that it’s insufficiently strict, but rather that it’s essentially optional. That’s because retail forex brokerages do not technically need to be registered in order to operate. Moreover, if they do register, they can choose between several organizations, depending on whose regulations most jive with their business models. The Commodity Futures Trading Commission (CFTC) is probably the most prominent regulatory organization in retail forex, and of which most retail brokers are registered. [It is also the organization that has proposed the rule changes that everyone in forex is currently talking about]. It was only in 2008 that the CFTC was vested with the power to regulate retail forex, but contrary to popular, only its members (rather than all forex brokers) are subject to the sword of its regulation. The Financial Industry Regulatory Authority (FINRA), the self-regulatory body for securities brokers,meanwhile, is trying to reach its regulatory powers into the arena of retail forex. In coordination with the SEC, it has proposed enhanced regulation for its own member brokers. Under this proposal, the handful of retail forex brokers that are registered with the SEC would be subject to stricter regulation than their counterparts under the control of the CFTC. Brokers registered only with the CFTC, then, would probably enjoy a competitive advantage (specifically the right to offer 10:1 leverage, instead of 4:1, as proposed by the SEC). Then, there is the National Futures Association (NFA), which operates in association with the CFTC. Not to mention the exchanges, themselves, which impose their own set of rules on brokers. Make no mistake; all of these organizations are fairly vigilant in pursuing violations and in revoking membership for those brokers that really run afoul. The problem is that such does not nothing to stop a broker from simply registering with another regulatory agency instead, and/or not taking advantage of client apathy/laziness by either not registering at all, or even worse, lying about the registration. In the end, most forex traders probably don’t care which regulatory organization ultimately wins the turf battle over the right to regulate retail forex. Ideally, though only one such organization would have such power, and all brokers would be subject. Given that this issue isn’t likely to be resolved anytime soon, for now, you would be wise to choose a broker that is registered with the CFTC. You can confirm a broker’s membership here. 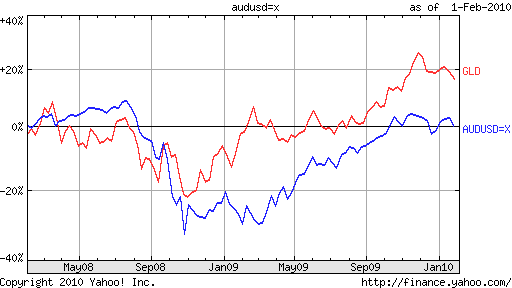 In 2009, so-called commodity currencies – both individually and as a group – registered record-breaking gains. The Brazilian Real and the South African Rand finished up more than 30%, while the Australian and New Zealand Dollars finished up about 25% each, and the Canadian Dollar not far behind. While the outlook for 2010 is slightly less rosy (if only because of the law of averages), investors would still be wise to keep such currencies on their radar screen. With the appreciations of 2009 canceling out the depreciations of 2008, currency markets are close to “equilibrium.” Going forward, then, investors will to find a rationale other than sheer momentum for making bets. Strong commodity prices represent one such rationale. This is not only the case because currency prices are rising and are underpinning the recoveries in the respective countries that are rich in their production, but also because economic recovery – and “normal” growth as well, for that matter – in many other economies is built precariously on debt and the expansion of sovereign money supplies. Commodity currencies – and commodities in general – have always held allure as investment vehicles because of their tangibility and necessity. Simply, modern economies depend on commodities for their functioning. Thus, countries rich in natural resources would seem to represent safe bets, since they can be assured of demand both during periods of expansion and during economic downturns. 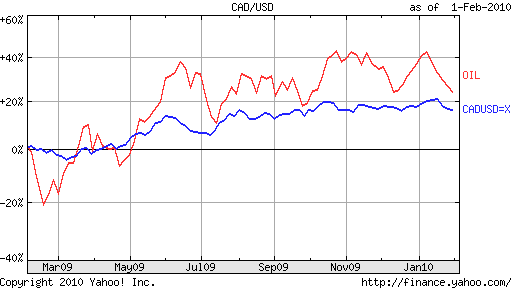 The strong performance of commodity currencies in 2009 underscores this point, since despite the fact that prices for many commodities are well below the record highs of 2008, these currencies are very close to their 2008 highs. More specifically, the Canadian Dollar often tracks the price of oil; this correlation will probably only strengthen when the oil sands of western Canada are developed. While rich in many natural resources, it is gold that both Australia and South Africa are famous for, and to which their currencies are often tethered. Brazil and New Zealand deal in a more diverse array of commodities, and the Kiwi and Real often move in tandem with broad-based commodities indexes. There is also the Mexican Peso (oil), the Russian Ruble (natural gas), the Norwegian Krona (oil), and Chilean Peso (copper), but the correlations between these currencies and the respective commodities for which they are famous tend to be looser. Of course, there are many other economies that are rich in natural resources, but for various reasons (lack of liquidity, fixed exchange rates), their currencies aren’t (as) appropriate for investing. Even the currencies I listed above don’t always reflect commodities prices. For example, Canada’s fiscal problems and South Africa’s monetary easing will arguably weigh down the Loonie and Rand, respectively, in 2010. For commodity pure-plays, your best bet, then, would be to invest in the commodities themselves. Of course, commodities don’t pay interest and their costs associated with holding them (whether directly or indirectly) and they tend to fluctuate with greater volatility than currencies. Another option is the just-announced WisdomTree Commodity Currency Fund, an ETF composed of a basket of commodity currencies, many of which I listed above.